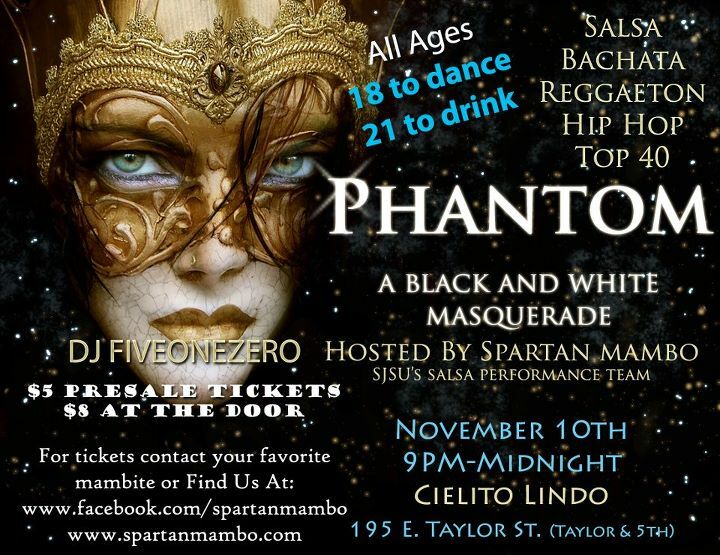 Come have a good time and support Spartan Mambo this Thursday at the Phantom Masquerade! The party starts at 9pm at the Cielito Lindo restaurant in downtown San Jose (195 East Taylor Street). This is an all ages event, and we’ll be dancing the night away to the hottest salsa, bachata, reggaeton, and hip hop music + great drinks at the bar for those who are over 21. Tickets are just $8 at the door, or $5 pre-sale. All proceeds from the event go to support Spartan Mambo. If you would like to support our club but can’t make it to the event, we also accept online donations.